Nintendo partner with Marvel to assemble the ultimate team. After 10 long years, the Marvel Ultimate Alliance series is back and coming exclusively to Nintendo Switch. The game is set to be published by Nintendo at some point in 2019. First revealed at the 2018 Video Game Awards, Marvel Ultimate Alliance 3: The Black Order is a brand new action RPG coming from developers Koei Tecmo and Team Ninja. The game’s reveal trailer didn’t give us much to go on, but it seems like fans of the originals can expect a proper return to the franchise’s classic team-based, beat ’em up roots. Those worried that the same rights battles that kept the X-Men out of games like Marvel vs. Capcom: Infinite can rest assured that won’t be the case this time around. The game’s trailer and promotional material both promise characters from across the Marvel Universe including the Avengers, the Guardians of the Galaxy, the X-Men, and more. Supporting up to four players, the game is set to include drop-in co-op, online play, and local wireless link ups. Players will also be able to select a dynamic “heroic view” which offers a more immersive perspective when played in either single player or multiple player across multiple Switch devices. Ultimate Alliance 3’s story will see Marvel’s Mightiest Heroes teaming up to defeat Thanos and the titular baddies, The Black Order. As longtime fans of the franchise, we could not be prouder and more excited to bring back ULTIMATE ALLIANCE with its biggest game yet. 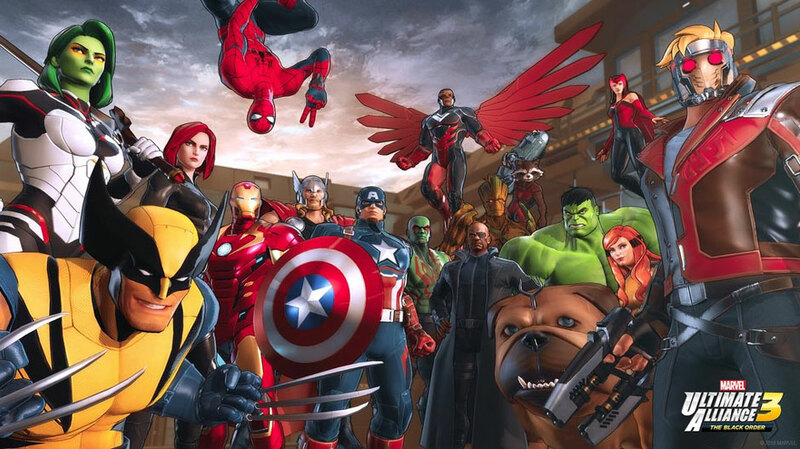 MARVEL ULTIMATE ALLIANCE is all about teaming up with your friends and creating your own ‘dream team’ of Super Heroes to go on adventures across the Marvel Universe, and Nintendo Switch is perfect for delivering on that promise of cooperative gameplay and shared experiences. In addition to being Koei Tecmo / Team Ninja’s first crack at the Ultimate Alliance franchise, this is the first time in the series’ history that the game will be exclusive to just a single platform. Marvel Ultimate Alliance 3: The Black Order is coming exclusively to Nintendo Switch in 2019.